The film follows Cloer over a period of five years, from right after the U.S. led invasion of Iraq to the escalation of violence in Afghanistan. Throughout this time span, Cloer witnesses the change in his industry from one that focused on selling armored luxury vehicles that can withstand multiple gunshots, to selling heavily armored SUV’s that can keep a passenger alive in the event of a massive explosion from an Improvised Explosive Device. Cloer is a very engaging character. He is, after all, a car salesman. The filmmakers allow him to be himself and lead the narrative of the film. He sets the movie’s tone through his insights into the nature of his business. At the beginning of film, the American invasion of Iraq provided Cloer with what he thought was going to be “The Perfect War.” He saw what was going on in Baghdad as an opportunity to sells thousands of cars. As the film continues, though, Cloer begins to note the ever increasing intensity of violence, couple with enormous government mismanagement and corruption. He also begins to dwell on the pathological relationship between the technological advances in his cars and what they are designed to protect his customers from. The once cocky Cloer becomes more and more careful and thoughtful as the movie progresses. The violence that he witnesses obviously begins to wear on him. He begins to question the need for his product, which, in turn, leads to questions about his role in all this destruction. This is a human movie. It is a movie about war. It is a movie about the randomness of violence in conflict. It is a movie about the toll chaos takes on our fundamental values. You don’t have to be disgusted by what is occurring in Iraq and Afghanistan to appreciate this documentary. You don’t even have to be a pacifist. What you have to be is human and have the slightest sense of ethics. 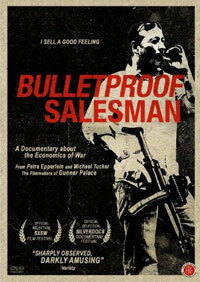 If you are and you do, then you will enjoy Bulletproof Salesman. As Cloer intimates towards the end of the film, as a provider of armored vehicles in the modern world, he has true job security.